Amazon Price: $363.99 (as of January 23, 2019 9:30 pm - Details). Product prices and availability are accurate as of the date/time indicated and are subject to change. Any price and availability information displayed on the Amazon site at the time of purchase will apply to the purchase of this product. 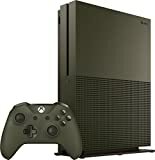 The Xbox One S 1TB Console – Battlefield 1 Special Edition Bundle includes: Xbox One S Special Edition 1TB Console, full game digital download of Battlefield 1 Early Enlister Deluxe Edition, military green stand and controller, HDMI cable (4K Capable), power cable, and a 14-day Xbox Live Gold Trial. Also includes the Hellfighter Pack, Red Baron Pack, Lawrence of Arabia Pack, a new visual appearance of the Behemoths, and 5 Battlepacks.